FDNA’s Year of Discovery unites clinicians, labs and patients for rare disease advancements. Throughout the month of May, FDNA and Blueprint Genetics will be driving discoveries for metabolic conditions, including storage disorders. As part of the initiative, Blueprint Genetics has pledged a donation of up to $2,500 in May to benefit the National MPS Society. Clinicians are invited to submit patient photos, diagnoses, and phenotypes to the HIPAA-compliant Face2Gene CLINIC system for analysis. “Having the patient’s photograph and comprehensive list of clinical findings and symptoms is really helpful in the interpretation of findings from genetic testing, especially for the larger gene panels and exome sequencing. Ability to submit this information to the interpretation team via Face2Gene would allow even better interpretation of the testing results.“ says Eveliina Salminen, M.D, Ph.D, Clinical Geneticist, Team leader for Interpretation Team, Blueprint Genetics. Blueprint Genetics will match each case uploaded in May with a $1 donation to the National MPS Society, up to $2,500. 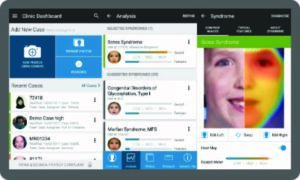 The Face2Gene deep learning technology will de-identify and analyze the shared cases to identify new phenotypes, facial characteristics and genes that are associated with rare diseases—advancing our understanding and hope for the future.